The question is an intriguing one. As many of you probably already know, consuming chocolate can be fatal to dogs and cats. A friend of mine recently had to rush her dog to the vet because he ate most of a large cake with chocolate in it. The compound that is toxic to dogs and cats is an alkaloid called theobromine. Chocolate also contains small amounts of another, related alkaloid: caffeine. In fact, theobromine is a chemical precursor to making caffeine in plants. (Some of the older literature suggests chocolate does not contain caffeine, but newer, more sophisticated chemical tests have shown that caffeine is indeed present in chocolate). See the Hershey website for a discussion of theobromine and caffeine in chocolate. Caffeine is known to kill insects. Nathanson (1984) suggested that it was a naturally occurring pesticide, and showed that it can inhibit growth in tomato hornworm larvae. More recently, scientists have been looking at genetically modifying tobacco plants to make caffeine. Their thinking is that the caffeine would repel or kill insects that feed on the tobacco. In their experiments, the caterpillars of the tobacco cutworm and small white avoided eating plants treated with caffeine. It was a repellent (Kim, et al.). 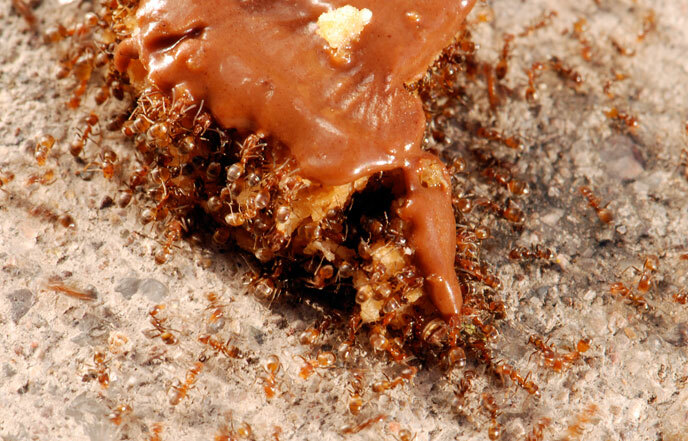 As personal experience, I had once used a chocolate-covered peanut butter candy as a bait for some ants. The sidewalk ants seem to prefer the peanut butter, although possibly a couple are trying the chocolate. It isn’t clear. This fire ant also seems to be feeding on the peanut butter part. This highly-limited evidence might suggest ants might also be repelled by certain ingredients in chocolate. Miyashira, et. al. recently looked at the effect of caffeine on leaf-cutter ants. 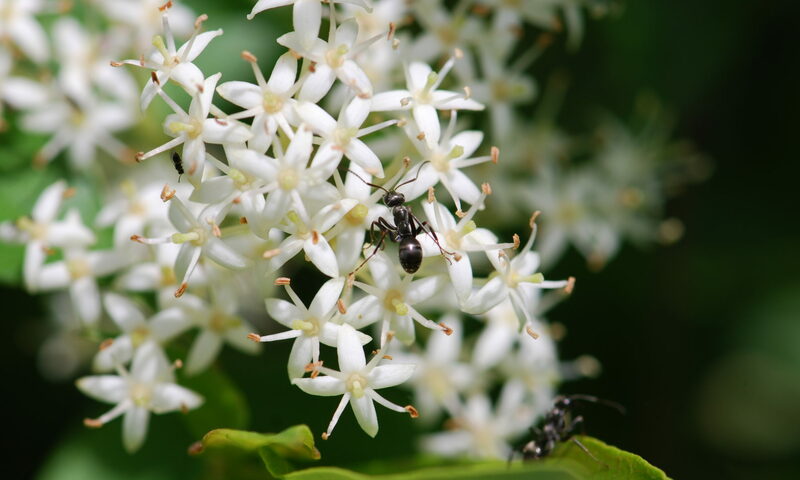 They found that although there was “no conclusive effect” on the ants, the higher doses of caffeine did kill the mutualistic fungus that the ants use for food. 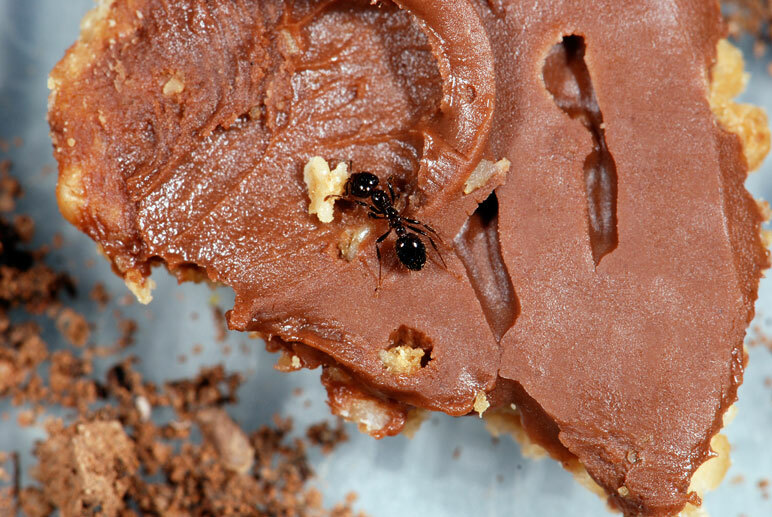 Back to our central question, can chocolate kill ants? Obviously caffeine can be a repellent and potentially have adverse effects on on insects. Caffeine is only a minor ingredient in chocolate, however. Chocolate is a conglomeration of some 300 different chemicals, any one of which could have an adverse effect on ants. Obviously more research needs to be done. I was intrigued by this problem enough to set up a small experiment. I let you know more about that in an upcoming post. What do you think? Do you know if chocolate has an effect on ants? Carlos H Miyashira, Daniel G Tanigushi, Adriana M Gugliotta, Déborah YAC Santos. (2012). Influence of caffeine on the survival of leaf-cutting ants Atta sexdens rubropilosa and in vitro growth of their mutualistic fungus. Pest Management Science. 68 (6): 935–940. Nathanson, James A. (1984). Caffeine and related methylxanthines: possible naturally occurring pesticides. Science 226: 184-187.